Here at the Swift Agency, still one guy who might have a blogging addiction, I often say that the moment that I step out of the Taylor Nation I get lost. But in the case of the fabulous trio of Charles Kelley, Dave Haywood and Hillary Scott, I’m glad to get lost in music. 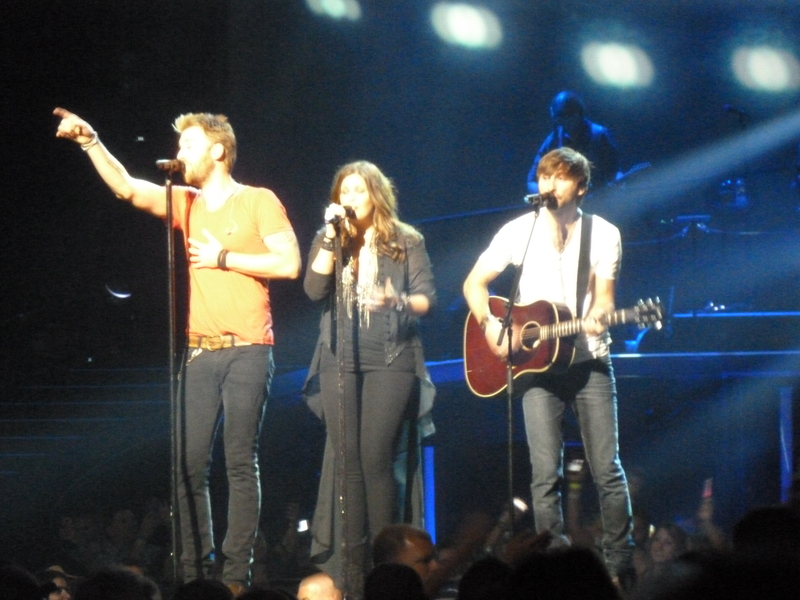 This was the first time that Lady Antebellum makes a stop in Montreal. The show emphasizes music above all, with the lights show accentuating the effect. Three large screens follow Charles, Dave and Hillary or alternate between video clips or audience takes. The performance was amazing. There’s no doubt that they are seasoned professionals. 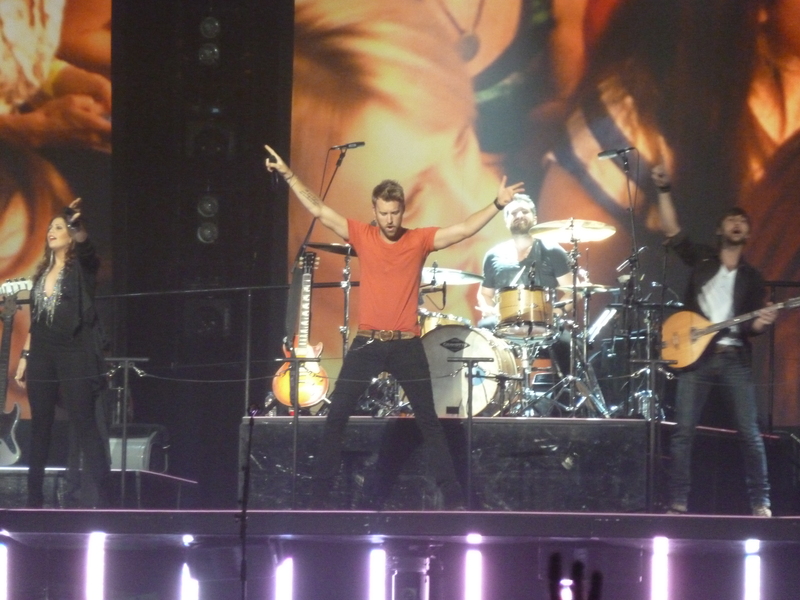 However, what won the crowd at Bell Centre on Thursday, June 14 was not how great Lady Antebellum has become, but how much passion and heart they pour into each of their songs. It helped that they picked some of the best acts opening for them too. First up, was the award winning duo known as Thompson Square. Shawna and Keifer brought out the country and the rock in their set which included their hits I Got You, Glass and Are You Gonna Kiss Me Or Not. They also incorporated a rock medley of well known rock songs like Kiss’ Rock and Roll All Nite. I’m always happy when the opener for the concert is well received, and Thompson Square is fit to be a headline act. I saw them win best Video Duo on the CMT Awards 2012 back in June 9 for I Got You. By the time they closed their set with Are You Gonna Kiss Me Or Not, everyone was singing along. Darius Rucker took the stage to thundering applause. He played among others, Alright , It Won’t Be Like This For Long, Space Cowboy , Don’t Think I Don’t Think About It , Come Back Song and Southern State Of Mind. He also didn’t forget his Hootie & The Blowfish years by singing his old hits Only Wanna Be With You and Hold My Hand. It was not his first time in Montreal, or Bell Centre. I saw Darius opening for Brad Paisley in January 29, 2011. Just like then, he closed with a cover of Prince’s Purple Rain that had the crowd applauding him for a long, long time. Lady Antebellum has country and rock and roll roots. They themselves are fans of Tom Petty, and I like to call them the Fleetwood Mac of country music not only because they are influenced by them but because they have that same influence on their peers. At this point they are trendsetters themselves. They opened with their current anthem, We Owned The Night and they didn’t let up as they went through each of their hits: Stars Tonight, Our Kind Of Love, Love This Pain, Dancin’ Away With My Heart, Wanted You More, Perfect Day and Love Don’t Live Here Anymore. I will make a stop to say thank you as I finally heard Hello World live and it was one of the best of the night for me. They brought their band to the forward stage for an acoustic version of American Honey and then brought back Thompson Square and Darius Rucker for a country medley jam. After a rousing performance of I Run To You and Just A Kiss, they took their leave. Then with the four piano keys everybody knows well, they came back for their encore with Need You Now.